Sales Marketing Management Quiz: Are You Right for the Job? Home > Is This Career for You? 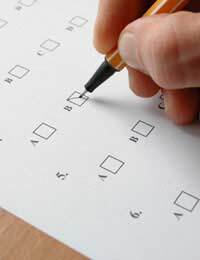 > Sales Marketing Management Quiz: Are You Right for the Job? So you’ve seen plenty of advertisements for sales marketing management positions and you’re intrigued by the starting salaries and job descriptions. So why not try to get your proverbial “foot” in the door by sending information…? Wait! Before you email or “snail mail” your CV (curriculum vitae) to a prospective employer, ask yourself a huge question: “Are you right for the job?” Fortunately, you’ve come to the right place to help you confidently reply to that query! The following quiz has been designed to help you decide if it’s worth attempting to snag a sales marketing manager interview. Though it’s not an end-all, be-all answer, it will definitely help you determine if you’re headed in the right direction. QUIZ: Are You Right for the Job? 1. How many years of sales experience do you have? 2. How many years of marketing experience do you have? 3. How many years of managerial experience do you have? 4. What business credentials do you possess? 5. Why do you want to be in a sales marketing management position? a.	I’ve heard that sales marketing managers make a decent salary. b.	I’ve been working in the sales and/or marketing field and I enjoy it. c.	I’ve planned to be a sales and marketing manager for most of my career and have worked toward a management position. Put away your CV because you definitely need more experience before you attempt to tackle a sales marketing management job. This isn’t to say that you might not make an exceptional sales marketing manager in the future, but it’s unlikely that you’ll be doing anything besides wasting time, energy and paper to send in a sales marketing management cover letter and CV at this point in your career. If you’re really intrigued by the notion of becoming a sales and marketing leader, try getting an entry level job in a sales or marketing department. Additionally, you may want to invest in business-related schooling and training, even if you only spend a few hundred pounds per year to attend conferences or obtain certifications. Doing so will make you a more marketable candidate for sales and marketing management positions in the future. It might be worth your while to send a CV to the next employer seeking a mid-level sales marketing manager. While you don’t necessarily have tons of experience in your background, you’ve been in the workforce long enough to have a track record; if it’s clean and impressive, you have a better-than-average chance of obtaining an interview.